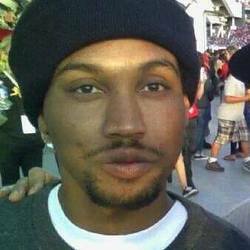 San Francisco police shot and killed Mario Woods, a suspected stabber in the Bayview District late afternoon on December 3, 2015, after he approached an officer while holding a knife, police said. The shooting, which authorities said occurred on Keith Street after officers tried and failed to subdue the man with nonlethal beanbags, was recorded by someone on a Muni bus who posted the video to Instagram. Police Chief Greg Suhr told reporters that the video confirmed the suspect “does have the knife in his hand and he does move toward officers.” But San Francisco Public Defender Jeff Adachi, after watching the same video, said it appeared that “the person was not posing a direct threat and certainly did not have to be shot.” The video shows the man up against a building gesturing as armed officers surround him. A bystander can be heard shouting, “Just drop it!” The man, his hands at his sides, is seen walking away from at least four officers but toward one officer, who steps in his path, walking backward with his gun drawn. Moments later the camera turns away as the first of at least 15 shots ring out. The camera does not capture the man’s last movements. On January 20, 2016, it was reported that all officers involved in the case were back on the job. October 2016 "Gascon needs to come out of the office, stop playing and charge the police with the murder of Mario woods," said Elaine Brown, the Black Panther Chairwoman, speaking of George Gascon is the District Attorney of San Francisco. In March 2019, it was reported that San Francisco will pay an undisclosed amount to the mother of Woods to settle a lawsuit over his death. John Burris, an attorney for Mario Wood's mother, told the San Francisco Chronicle the amount of the settlement and other terms will remain confidential until the Police Commission and the Board of Supervisors approves them. San Francisco’s police oversight body will investigate all police shootings under a ballot measure passed by voters Tuesday. Proposition D, which needed majority approval to pass and received 80 percent in support as of press time, ensures all police shooting incidents will be investigated by the Office of Citizen Complaints.